Luxurious unit containing 1036 square feet and located on the 5th floor of Beachside Two and offers breathtaking views of the beautiful emerald clear waters with white sand beaches. Kitchen and bathroom are totally remodeled. This spacious one bedroom/ one bath unit is not your typical unit – beautifully appointed like a Tuscany Villa but with all the modern luxuries of today. As you walk in, you notice the spectacular Gulf view from the windows out to the balcony. The walls are venetian plaster, complemented with comfortable furnishings. The living area is spacious with large TV that can be seen throughout the area. 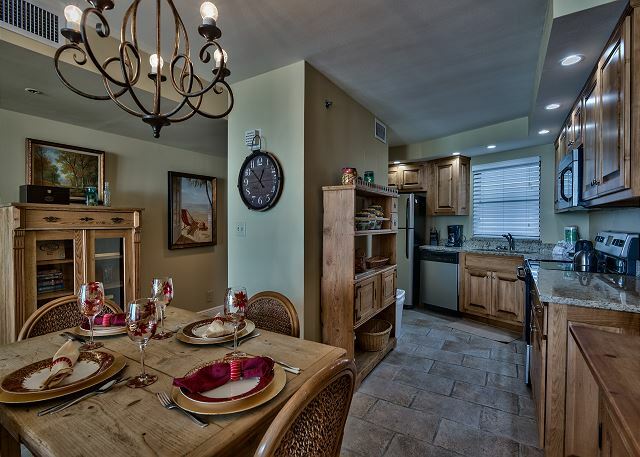 The kitchen is fully equipped to make fresh seafood or a delicious Italian meal. There is a luxurious king sized bed, just perfect for waking up and enjoying the wonderful gulf view directly across from the bed. The balcony is gulf front providing a great view of the Gulf. 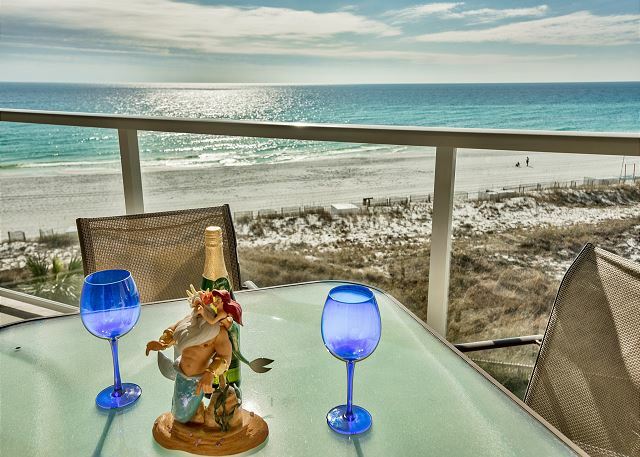 The amazing views from this condo of those exquisite aquamarine gulf waters and beautiful white sandy beaches never, ever got old! Unfortunately, it was an extremely chilly week that ended with steady rain, but weather is always that unknown factor. The resort is beautiful~walking or driving around the complex is an activity in itself. The Village of Baytowne Wharf is charming. Nearby grocery stores, drug stores, restaurants and shopping give you great options on those non-beach days. A Ben & Jerry’s within walking distance~priceless. Dealing with Bette was beyond delightful~she does everything possible to make your stay everything you hope it will be. We had a few minor issues, called the given phone number for on-site help and this really great guy (never gave his name) was on it immediately. Previous reviewers shared thoughts on recommended improvements to the condo (aka furniture), which make sense. 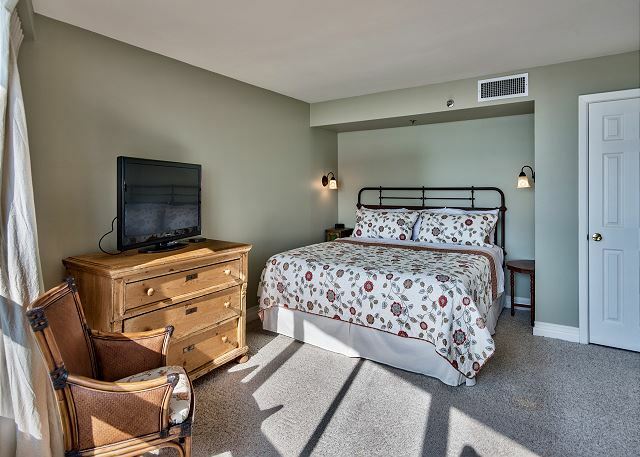 We might just add that they may want to upgrade the bedding from a bedspread, wool blanket and older sheets to something a little more modern and hygienic like a duvet and a cover that can be washed, with crisp new sheets. We are so thankful for your appreciation of the views, the condo and us. The spread is brand new and definitely personal choice, which I understand. Please come back often. The weather is thankfully beautiful. It was a nice area and the unit has a great view. I think there should be more than one mirror. One should be added in the bedroom. The only mirror was in the bathroom. It was nice having direct access to the beach from the resort area. Thank you for your suggestion, and we will do that very thing. We look forward to your return. Everything was great. Would go back in a heartbeat. Highly recommend. Great communication, clean condo, and very attention to detail! Will definitely stay again! Had a great time in Destin. Bette was awesome to work with and the condo was awesome. We'll definitely come back to Destin Memories again! This is the third time we have stayed at this property and room and couldn't be more pleased with everything involved from cleanliness and amenities to ease of getting to and from the beach . The professionalism and ease of dealing with all involved makes for a very relaxing and enjoyable time. We have stayed in this exact condo for the fifth time. Each time we have enjoyed it and we will continue to come back time and again. Wonderful experience. A week of a NICE experience overlooking the Beach-Ocean! Very nice. Peaceful and serene. Place very clean. Property description accurate. The property manage, Bette especially, was extremely help and efficient. I would recommend the property and I would stay there again. Michael, I am so glad you see what a great condo this is and gave us all 5's, top rating. We will certainly check out your suggestions. We loved it!! Really close to the beach and the room was very nice!! We thought it was perfect!!! We loved this unit! Beautiful gulf view!! We loved the layout of the unit. It had a "homey feel" instead of the usual rental look and feel!! Working with Bette was easy and very pleasant. It is perfect for two people. We plan on returning many times in the future!! Bette was helpful before and during our stay. We loved the condo. It had everything we needed and more. Beautiful view from living room, deck, and bedroom. We WILL be back. I've been going to Destin for about 4 years now at the Sandestin resort. This year I tried out a condo. As soon as I booked the condo, I received an very thorough detailed attachment with instructions on how to get there, parking etc. (even shopping suggestions). When we arrived the condo was very clean and well maintained. We booked our rental with Bette and she was awesome from the start. She was always helpful and quick to respond to any questions or needs. The condo was as described, even down to the beach chairs and umbrella. We loved the location and the view. Super easy access to the beach and local restaurants. It was our first time in the Destin Miramar Beach area and we simply loved it. We hope to visit again in the future. Thank you for your appreciation as my goal is to have guests that truly enjoy themselves. That is so very important to me. Come back often. We have been coming to BS II for several years now and it has been wonderful every time and this was no exception. This condo was perfect with breathtaking views of the beach and gulf. You could watch the dolphins swim by as you sat on the balcony while at the same time enjoy the wind breezing through the palm trees located just below the balcony. The condo was very cozy and we really enjoyed using the beach supplies provided. We will definitely be back. Thank you Bette! You are great to work with. We really enjoyed our stay. The unit was clean and comfortable to live in. We would recommend it to friend's. Great location, very clean, everything was perfect. We worked with Bettye at Destin Memories and she was amazing. This was our fifth anniversary trip and the unit was beautiful. We normally stay at the beaches of 30A but wanted to give San Destin a try. I will warn you, the beach is crowded. But if that doesn't bother you, the rest of the place is gorgeous. Come back again. We love guests like you! Loved the condo and location. 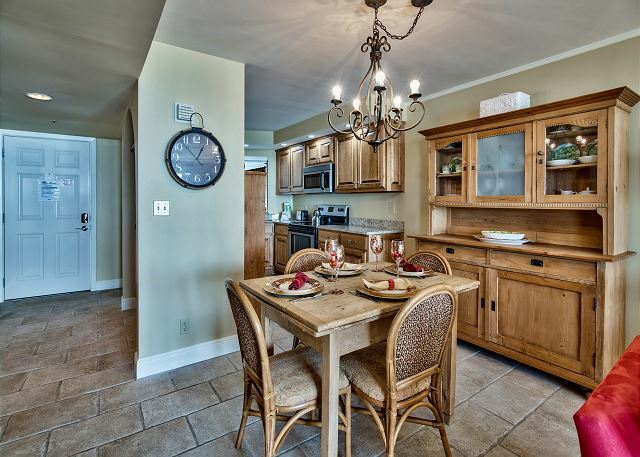 Sandestin has everything you need for a great vacation! This is our 5th year staying at Beachside 2.The room itself was nice and had perfect views. Some things are in need of update such as couch and bedding. Also the sliding door to balcony handle was broke off on the outside which was sometimes difficult to get the door back open. But overall i would stay in this room again. Heather, I wished you had called oncall for assistance. There are available 24/7. We will definitely address your issues. The kitchen and bathroom were remodeled a few months ago, and as I recall a new couch was purchased. I know the mattress is just a few months old so I suspect you are referring to the spread, which I will check into. As for the handle, I will get that immediately repaired. Thanks for the information, but again I wished you had made that oncall phone call. A relaxing experience. We cut it short 2 days because of Tropical Storm Cindy. Would return again. We are so thankful you enjoyed your stay regardless of the untimely weather issue. The weather has just been awesome all winter, spring and summer except for those 2 rainy days. 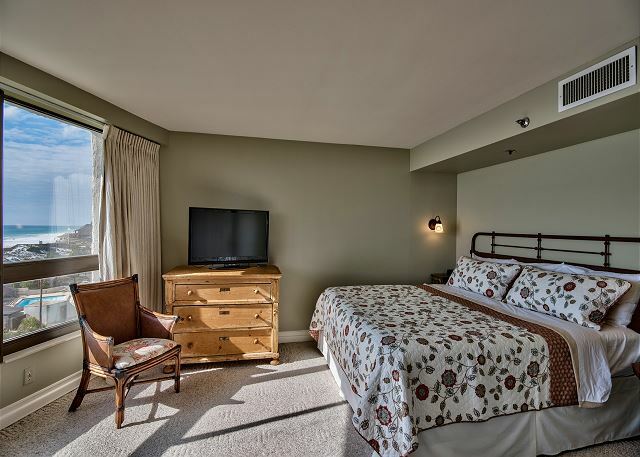 Everything was great except the bed was sagging and the bed linens were very poor quality. Stayed at the Holiday Inn Crystal Beach the night before we arrived and the beds there were great. We both had sore backs and didn't sleep well. The mattress is only a few months old, thus this is shocking to hear. Condo 4251 @ Beachside II was an excellent choice. Had everything needed for a comfortable stay. Accessible to the beach and pools of the condo. My wife and I will for sure be staying at this spot again. Bette our contact for the condo is very helpful and made things super easy. Thank you for the compliment for both the unit and me. Good location. Nice beach access. Great people to rent from. I noticed you have a 5 on all areas, so I assume you really enjoyed the unit. Nice quiet place with all amenities needed. Everything was as advertised. Wesley, please come back often. We are so thankful you see how great this unit is. Right on the beach close to many restaurants. Beautiful Tuscan style villa with view of beach from bed and balcony. We love the attitude of guests that can enjoy themselves good weather or bad. Please come back to enjoy it all again, and hopefully with good weather. Such a smooth experience. Booking was smooth and easy. Upon arrival the unit was very clean and every thing we expected. You could tell everything was new and fresh. Great view of the ocean from the balcony and bedroom. Bed was comfortable as well. Everything we needed in kitchen was found,just like we were at home. We thought we had left an item in the room after checkout and they were more than happy to help us out with that. We are so thankful you enjoyed your stay and that you see that our team is there for you. 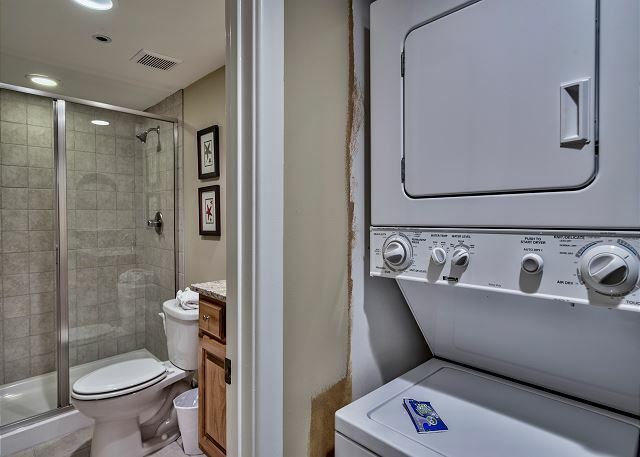 Overall, a good rental unit, however, there are definitely a couple of easy fixes that need to be made. The bedroom furniture is just too poor quality to put anything in it. The armoire clothes hanger pole is broken and hanging down. Not that it really matters because there was not ONE SINGLE hanger in the whole condo. The closet had artwork and a lamp taking up most of the floor space. The dresser drawers are just beyond poor quality. Needless to say we lived out of our suitcases for the week. The hardcase furniture in the main living area is poor quality also. You don't want to store your books or games or laptop or cameras or anything in them; very unfortunate. The balcony gets great afternoon sun so I'm not sure why there aren't any lounge chairs on it; just a table and dining chairs. Maybe it's a policy that no loungers are allowed??? 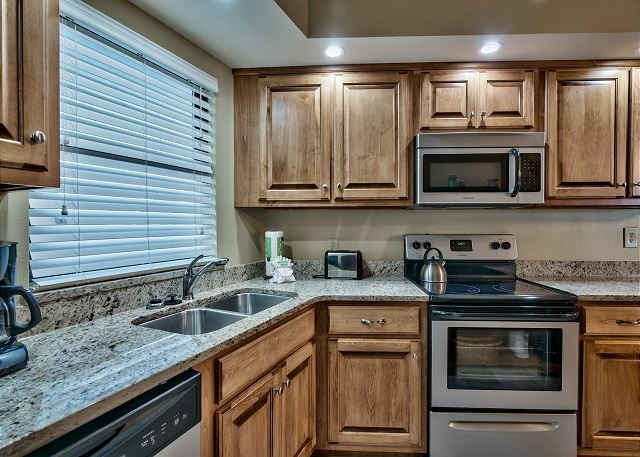 Other than that, the unit is very, very clean, very comfortable, kitchen well-stocked!! Laura, we have oncall that could certainly assisted you with some of your issues, like hangers and broken pole hanger. The kitchen and bathroom were just remodeled and the couch was recently replaced. I'm sorry you didn't see what other guests see but glad you saw it to be clean and had a well stocked kitchen. 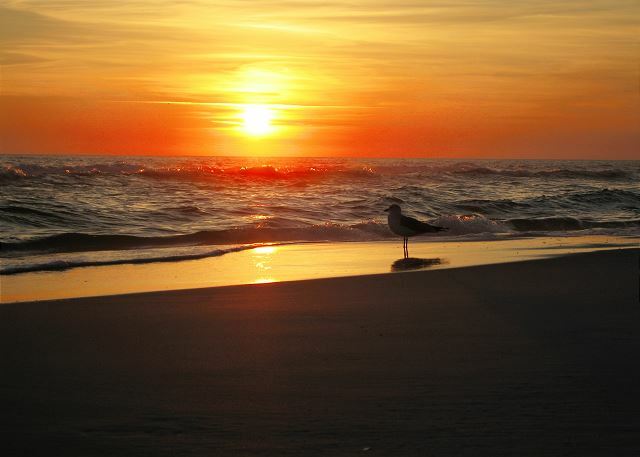 We have been coming to Sandestin for 4 years and love the area and all it has to offer. Loved our unit - it had everything we needed and was very comfortable. We had a small repair that was needed and needed a sweeper and both items were taken care quickly and efficiently. Enjoy working with Bette and Greg. Thanks for a great 6 weeks. We are thrilled as always that you enjoyed your stay and so glad you are coming back next year to stay with us. We rented this unit for the month of January and were the first renters after it had been renovated. It's as pretty as the pictures show and we really enjoyed our stay. 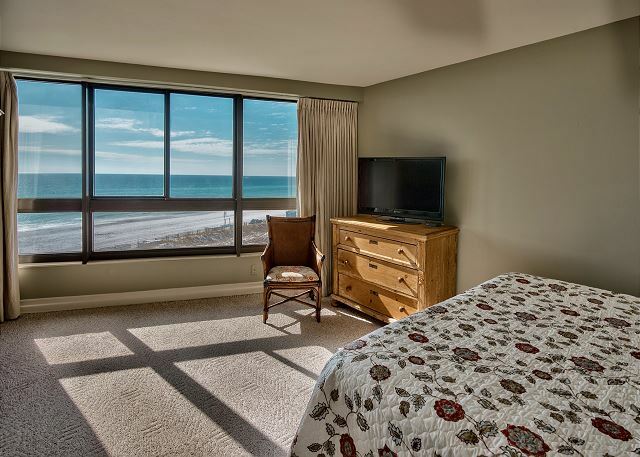 Views of the gulf from the living room and bedroom are stunning. This was our second year to use Destin Memoires rental services and were very pleased with their service and attentiveness. Bette Butler is our contact and she goes out of her way to make it a great experience. We had a problem with the kitchen sink and they had a repair person there within a couple of hours and fixed that day. 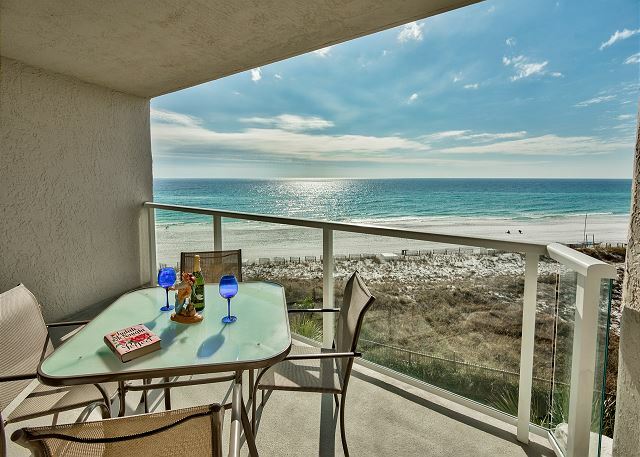 So, we highly recommend Destin Memories and recommend 4251 Beachside to other renters. You will enjoy it. Thanks so much for recognizing what an awesome unit this is! Great Condo with everything we needed. 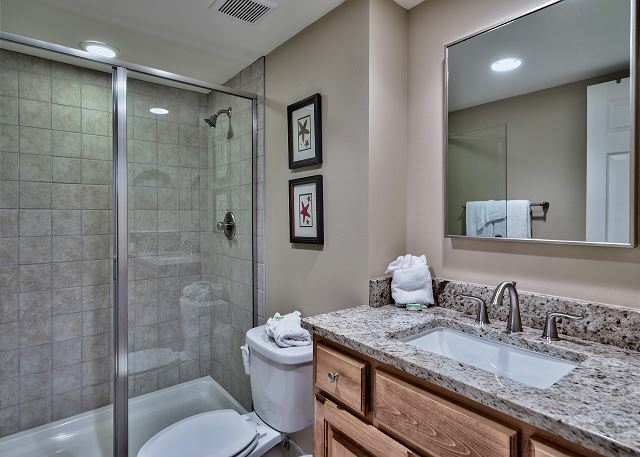 We are so thankful you enjoyed this gorgeous unit, and yet in November we are doing a remodel of kitchen and bathroom, so come back for an even greater experience. We have stayed at this exact condo for the past few years. We love it. Love the resort area. The Baytowne Village, and also that you are right there on the beach. We had a great time and the accommodations were very good. The location of the unit is perfect from all aspects...easy access to the beach or your vehicle, with close proximity to the bay, shops and restaurants. A short drive will allow you to visit near by beaches and towns. The beachside 2 community is quiet, secure, and not overpopulated. Bette and team at destin memories is the best. Thank you for your appreciation of my service and our team as well as this condo. We had a great stay in Beachside II. Destin Memories (and Bette specifically) was great to work with. We actually stayed for nearly 3 months and during that time you can expect a few small issues to come up. The test of a great leasing firm is how they react and Destin Memories was great to work with. We liked the unit so much that we already booked it again for next year. Thanks Bette and Destin Memories!